Your refrigerator is starting to show its age, but you just aren't excited about spending the money on a new one yet. That's a common problem many people face: You either buy a new refrigerator, which you can't really afford right now, or you call in a repairman, which you really can't afford, either. There is a third option - fix it yourself! I'm going to walk you through some of the more common problems along with some simple solutions that may save you a ton of money. To better understand the intricacies of the refrigerator and how it works, check out this article before we begin. The refrigerator is a pretty complex appliance and there are quite a few potential causes for each problem. We'll examine the easiest solutions. Some of the more major repairs should be done by a professional, such as replacing the condenser or compressor, but if you have to go that route, you may just want to buy a new fridge. Let's hope we can save you the trouble and handle your problem here first. A VOM (volt-ohm meter) will be needed to check certain parts. Always turn the power OFF, or just unplug the refrigerator. I find it's a good idea to have a notebook handy to record what you've checked and how things go back together so you're not scratching your head later. Problem: The refrigerator won't run at all and the light doesn't come on. Solution: Unplug the fridge and check the outlet for power with the VOM. Check the plug and the chord for any breaks or cuts. Problem: Everything freezes inside the refrigerator compartment. Solution: Check the thermostat dial, usually located directly in the front or near the rear of the refrigerator compartment - you may have to turn the dial down. A faulty thermostat could be the cause here as well. Open up the control panel - the thermostat is located directly behind the dial. Turn the dial to the coldest setting. Set your VOM to RX1 and probe the two terminals (with the leads off) and look for a reading of zero. Remove the thermostat, set it on the warmest setting and place it in a working freezer for 30 minutes. Re-probe the terminals and the reading should be infinity. Problem: Refrigerator runs constantly but doesn't get cold. Solution: Check the thermostat dial and make sure it's not on the warmest setting. The condenser coils may be clogged. Remove the bottom front or rear panel and vacuum under the refrigerator. Try to reach as far as possible with the extension wand to clean the coils. If neither of these solved the problem, here are a few others to check. Condenser fan is blocked -- Remove the rear panel and remove whatever is blocking the fan. Clean any other debris while it's open. The door may not be closing all the way -- Check to make sure the fridge is level. If it's not, there are legs with threads underneath that you can screw/unscrew to the desired effect. Also, check the door hinges to make sure everything is lining up right. The door's gasket may be bad -- To replace the gasket, lift the gasket and unscrew the holding screws. As you remove the old gasket, feed the new one into place and tighten down the screws. Door switch may be bad -- If the switch is bad, the light will stay on inside and keep things warm. The switch can be pried out with a flat screwdriver. Remove the leads and set your VOM to RX1. Clip the probes on the terminals and you should read zero with the switch open. Close the switch by pressing the plunger; the reading should be infinity. If not, replace. 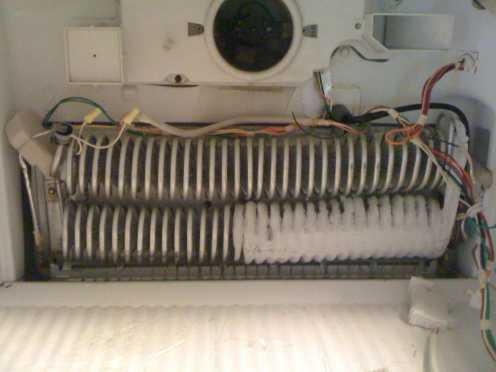 Evaporator fan could be bad -- Remove the back panel on the inside of the freezer. Unscrew the fan housing and remove the leads from the fan. Probe the two terminals with your VOM set to RX1. If you get a reading under 50 ohms, or an infinity reading, replace the fan. Condenser fan could be bad -- The condenser fan is located underneath the fridge. Access is easiest through the rear bottom panel. Disconnect the leads and follow the same instructions as the evaporator fan. Refrigerant may need to be replaced -- For this, a professional should be called due to all the environmental laws surrounding refrigerant removal. Problem: The outside of the refrigerator sweats. Solution: In many refrigerators there is a switch that controls the fridge from sweating in humid weather. It's located near the control panel inside the fridge. Make sure that it is turned on (turning it off in cooler, dryer weather helps conserve energy). To test the switch, open the control panel and remove the leads from the terminals. Clip the probes of your VOM, set to RX1, and take the reading. It should read zero when it's switched on and infinity when it's turned off. If not, replace. If the switch is OK, then the heater itself, called a mullion heater, could be bad; this would require a professional to repair. Problem: The refrigerator cycles on and off constantly. Solution: Clean the condenser coils as explained above. Check for a blocked or faulty condenser fan as described above. The compressor could be bad and would require a professional to replace. By keeping the area around your refrigerator clean, you could save yourself from a number of these potential problems. Vacuuming the condenser coils on a routine basis is a great way to ensure they don't get clogged. With pets in the house, you may want to clean it more regularly because of the hair buildup. If you let these minor clean-ups go, it will cause your electric bill to increase and eventually, what would have been an easy repair will turn into a more problematic and expensive one. Don't forget - have the make and model number of the refrigerator before heading to the parts shop. You don't want to need them and not have them. That'll cause you to lose your cool.